Kids and parents alike love the simplicity, ease-of-use, growth and value that the Mini Turbo provides. The combination of a single supportive strap that captures the entire boot and EZ Feed ratchets means less fumbling with gear and more time on the slopes. 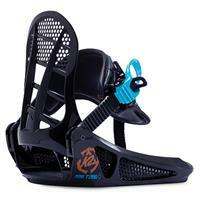 Kids feet grow, why shouldn't their bindings? The integrated chassis/highback is easily adjustable to three different lengths.